Hey, if there are any readers out there who have connections: Let’s get a meeting! Yes, why isn’t there a show on HGTV on preserving our MCM houses? Pam, you would be the perfect host and can feature all our homes and projects to keep them intact! I’ve been saying this for a couple years now. A while back, I even sent an email to HGTV with a copy of Pam’s video from one of the home shows. Pam, I think you’d do a much better job than the starry-eyed blond at Diynetwork! haha hard to compete with starry eyed blonds, though! Ha! They are a dime a dozen–especially here in California. The Granite Temptress – I love that! Don’t forget the Travertine Harpy and Tumbled Stone Siren! Gotta love it. I think if I see one more HGTV show lauding the merits of granite ghoulishness and anything “Tuscan” I think I’ll hurl my Mirro Bakery Press cookies all over the TV screen! Great article and more publicity for preserving what we have rather than destroying 50’s unique and installing what everyone else has. I saw a show on the DIY network for a bathroom reno and they were destorying a pink bathroom. It physically hurt to watch the show. Was that the bathroom I just saw this past weekend with pink and gray tiles? It was really neat – the floor had a beautiful pattern, too. I don’t remember if that was DIY or HGTV, but I know what you mean about it hurting to watch! I turned the channel. I would feel better if they would even just try to recycle parts of it! The show I saw was one where the house was up for sale — they should have left it as it was, someone may have been interested in the original state. I know I would have been! I have a 50’s style bathroom and love the tile but the grout is cracked and falling out in the shower area – any advice on how to fix the grout so we can keep the tile. I’d love any DIY suggestions or vendors we could hire to do it for us. Jady, it’s hard to recommend individual vendors because the country is so large! Start asking all your friends and family for references — you need to find someone who is very conscientious about restoration… who “gets it.” Good luck. Whoops, good point! 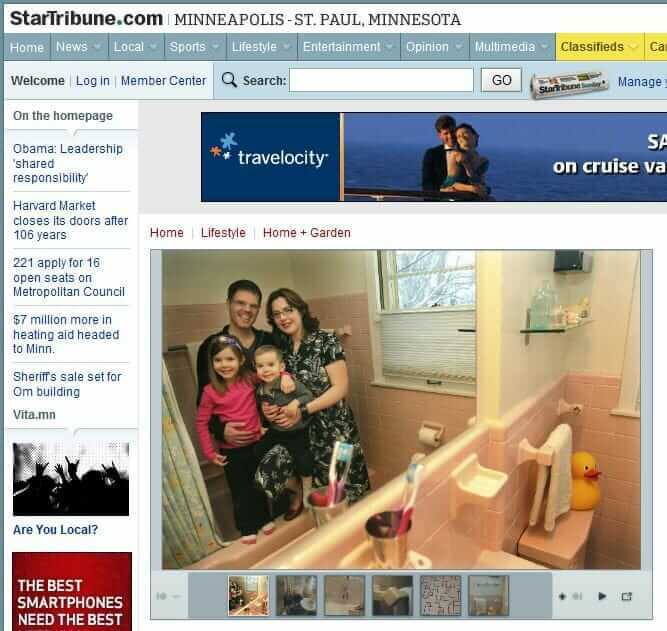 I initally saw this article on my local newspaper’s website (Mpls)so I made the mistake of assuming you were local. oh! hmmmm…. i think you should call/ask Carri, who is a reader who is quoted. also a bathroom designer and homeowner — she might be able to make a reco! Jady: while the photo makes our bathroom look pristine, some of our grout is in need of refreshing. I’ll let you know if I’m able to find someone good! I’ve just begun my research quest and am checking with friends and maybe Angie’s List. Woah, Meghan: You and your DH and weebits are SO CUTE, stashed away in your pink bathtub. Thanks for being pink poster family for this newspaper story! Fortunately, regrouting is easy. The problem is that you can’t use the shower for 48 hours after you do it. I have done some regrouting myself but I have also hired a local company to do it. It was very inexpensive which is why I went with the professionals last time and will again moving forward. They used a steaming process to get any discoloration out of the existing grout, ground out the loose grout and regrouted those areas in two bathrooms and recaulked where the tub meets the tile in the main bath. All of it was under $200. I am in the Pittsburgh area where prices in general remain very reasonable. It is a flooring place here that offers this service so I would recommend starting with small flooring places in your area. Good luck! Thanks Puzzy. I will look into this, and appreciate the advice! Get familiar with the blog’s navigation, Linda. I am all about uncovering and sharing RESOURCES to help you get the job done. Go to the blue navigation bar above, or the long column/index to the side — Bathrooms/Tile is where you want. Go thru the the stories to review resources. Lots of folks find success with B&W. Good luck. Linda, I am Carri from the article. I also work at a handmade tile showroom in NE Minneapolis. We carry B & W tile and I can help you save your bathroom. Let me know if you would like some help.